Inside, it has a blush suede-effect lining, three compartments, a flap zip pocket and a leather card compartment. It has a detachable and adjustable chain strap and an additional detachable and adjustable leather across-the-body strap, which features six holes for different adjustable length. 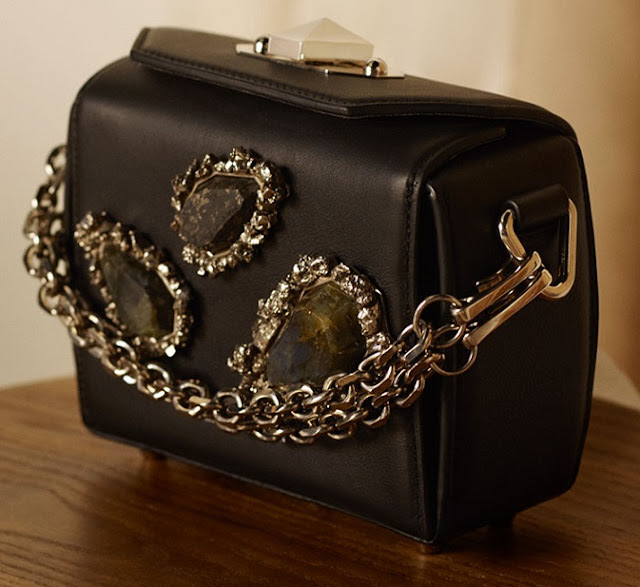 The bag can be worn in multiple ways: hand-held with the chain hanging as a decorative chain, with a short chain hand carry, with a chain shoulder carry or across the body with the leather strap. The bottom base of the bag has four brass metal feet. Alexander McQueen signature embossed in silver on the center bottom. Brass hardware with an antique silver finishing. Is this the best handbag of 2017? The Box Bag has a shape inspired by antique luggage as well as from a treasure chest. This handbag features a distinctive fold and twist lock closure. The Box Bag is crafted in Italy from luxurious grained leather and a sleek suede lining. This versatile design can be worn crossbody or as a shoulder bag or clutch. 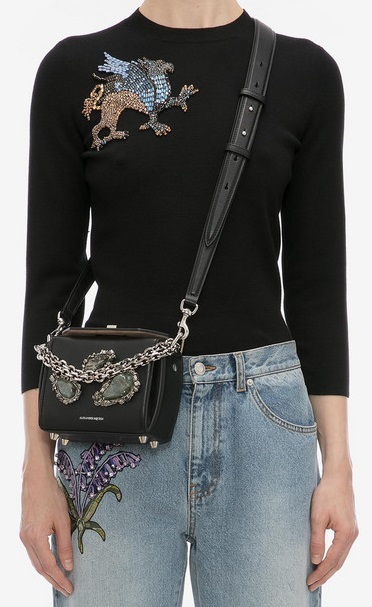 Learn more about The Box Bag at the Alexander McQueen website. Thank you for taking the time to read this luxury handbag blog post. We hope that you have found this fashion blog post to be enjoyable. It is very possible that you just read about the best handbag of 2017. If you have comments or questions, please add your thoughts in the discussion area below.